We homesteaders are among the citizens who pay a good deal of attention to the programs and operations of both state and federal agricultural departments because they can directly affect us (for good or ill). We often make use of our state ag departments’ extension services for education in things like beekeeping, land use, community ag promotional programs, etc. And we keep track – often with some trepidation – of the various ways that the U.S. Department of Agriculture [USDA] can make or break our attempts to make our livings off the land and the work we put into it. Under this rubric come permissions and restrictions for selling our produce and other home-grown products to the public, to local and regional government programs, food banks, schools, etc., as well as all those expensive and tiring hoops we must jump through to obtain and keep certifications for organic labeling, etc. We live on and off the land, and must keep ourselves abreast of the tricks of that trade. In this blog I have expressed some reservations about Tom Vilsack, who was appointed Secretary of Agriculture by President Obama some years ago, due to his corporate-friendly policies. Particularly in regards to Monsanto’s agri-chem and GMO activities, which are a considerable threat to organic producers. He has also been somewhat less than supportive of local producers being allowed to supply raw and processed foods to local schools and food banks, which we see as an important part of the ‘locavore’ – “Eat Local” movement. Buying and eating foods grown and processed close to home removes one of the most environmentally insidious government-subsidized cost-adds to our food supply – the costs of transporting foods grown in other states, regions and countries from farm to processor, and from processors to market. Almost all of it accomplished by the burning of fossil fuels. The U.S. government has been operating for some months under what is known as “sequester,” one of those hostage threats Republicans in the U.S. Congress used to try and get their policies enacted despite being unable to win actual elections on the merits of their ideas. This seq uester has cut spending levels across the board fairly drastically, and crippled many government agencies and departments to the point where some of their most important jobs don’t get done. USDA is one of those crippled departments. For example, the sequester has slashed government subsidies to school districts to help support their school breakfast and lunch programs. At the end of this month (October) schools will have to provide their own funding exclusively, though the government claims they will be reimbursed at some point. If the sequester is ever recinded, and now presuming those same Republican hostage-takers won’t keep the entire government shut down indefinitely while crashing the world’s economy by refusing to pay the bills for appropriations they’ve already allotted from the budget. Concurrent drastic cuts and cut-offs to both the SNAP (Food Stamps) and WIC food programs are cutting deeply into the ability of families – many of them working full time but earning minimum wage – to put food on the table. With neither school feeding programs or food assistance from the government, a great many people will simply have to do without. We know that doing without food isn’t a particularly healthy way to live, but at least one party in our political system doesn’t think that’s a problem. I presume they and their families eat very well, thanks. We certainly pay them enough for that. Both SNAP and WIC will run out of funds nationwide by mid-November. Just in time for the holidays! Funding for rental assistance has also been cut, and no new farm/business loans are being processed. Farmers who had previous loans through USDA and have sold this year’s crops can’t get the checks cashed because county offices for the Farm Service Agency are all closed. A freak autumn blizzard in the Dakotas killed thousands of cattle and horses, but the conservation arm of the USDA cannot help to get the dead livestock buried. This is obviously a serious issue for the immediate health and well-being of both rural dwellers and healthy livestock. From here on, until and unless our government flunkies in Congress wake up and do their too well paid jobs, we are all on our own. Severe weather affecting farmers and ranchers will not be mitigated by the usual government emergency loans and/or mobilization of resources. Families going homeless and hungry through the winter will not be aided, nor will they or their pets or any farmer’s lost livestock get buried when they finally die. Hell, in another [not ag related] outrage of Congressional shananigans, the families of our soldiers dying in Afghanistan and elsewhere are no longer receiving the ‘death benefit’ they are entitled to, so not even our war dead are getting buried if the families don’t have cash on hand. This situation is obviously untenable and cannot keep going for long, but I see no signs that the radical reactionaries in Congress are willing to do anything whatsoever that might save the nation from absolute ruin. If something doesn’t give very soon, by the time agricultural America gets started planning the spring crops there may be no national government at all and no help for anyone to access adequate food. There are a few things we can do. First and foremost, call and/or write your congressional representatives and let them know this obstructionism must stop. Now. Let all your friends and family know how important it is that our representatives face harsh pressure on these issues. Get involved with your county and state electoral organizations and help draft decent candidates to challenge die-hards in next year’s elections. Think hard about running yourself if you believe you can do a good job, everyone you know will be thankful. Get together with your homesteading and farming neighbors and meet with your community aid organizations (like Lions, Kiwanis, 4-H, etc.) to expand community shares programs, community gardens and crop set-asides to go directly to local food distribution services and schools for feeding hungry people. Do as much fund-raising as you can – host events, give public presentations, lobby county and state governments as well as local businesses and corporations – to replace necessary funding for programs to help our communities. If we go ahead and act as if the federal government is no longer in the business of serving the people, we can make concrete plans to serve each other. Then, when (and if) the dust in Washington settles, we may find ourselves much more committed to each other and much more capable of doing for ourselves. Which, in the end, may be the best lesson the political class in D.C. could ever be taught by ‘We The People’. The first week of July here in the southern Appalachians has been positively diluvian. That means we’ve had so much rain – falling at the rate of 1-2 inches an hour spaced in waves throughout the day and night – that I’ve literally considered that I ought to build an ark. Worst day of all was the 4th of July, which brought more than 6 inches of rain, flooding streets and fields and swelling creeks to dangerous levels. Nearby towns cancelled parades, picnics and fireworks shows. Sun finally came out yesterday, but the creek’s still high. However, with the overdue appearance of old sol in the daytime sky, the fat, well-watered blackberry crop may finally ripen instead of simply mold itself into oblivion. Tomatoes and peppers may kick in at long last as well, you never know. But my issue right now has to do with one of my apple trees that managed to lose its footing in what has become a pure mud-bog. It’s a total loss after only 15 years of production, leaving me with just one producing apple tree. Must get a few new ones or we’ll never have home grown apples again. One of the kids visiting for the holiday helped me salvage the unripe apples on that tree, hoping I could do something with them despite the fact that they’re three weeks to a month away from ripe. They’re filling three large baskets on the dining table right now, still waiting for me to figure out what I want to do with them. Now, I could quarter them and cook them down in a big pot, then strain for pectin to use when making jams and compotes later when the peaches, pears, berries and grapes come in, but it seems a waste of my Final Harvest. I could use them for applesauce instead, but they’ll need a lot of sugar. Maybe I’ll make unsweetened sauce and save it in the ‘fridge until the blackberries are ripe, make some combo sauce (will need less sugar). Or I could peel and slice them for drying in my nifty solar dryer – which hasn’t seen service so far this year – then hope against hope that the sun may stay around long enough to do the job. They could be half-dried, then reconstituted in sugar water before drying again for snack bits and/or pie filling. But they’re small, would make very small dried tidbits. So of course I went looking for crab apple and little green apple recipes, found some intriguing ones. Below are the most promising ones I’ve found. I’ve enough apples to try several methods of preservation, may save the drying for the rest of the crop that’s still growing. Will report on how they turned out, so stay tuned! Wash apples, quarter with skin on and cut out the seeds. Combine the wine, sugar, spices and salt, Bring to a simmer while stirring constantly. When the sugar is completely dissolved, add the orange slices and apple quarters. Cover and turn heat to low. Simmer for 5 minutes or until the apples are tender, just before the skin starts separating. Remove apples and pack loosely in half pint jars. Strain leftover wine and add this to the jars to 1/2 inch from top. Cap, cool, then refrigerate or freeze. Should keep at least a week in the ‘fridge, several months in the freezer. Serve as appetizers on bamboo skewers or long toothpicks. Wash apples and tomatoes. Peel and core, dice apples and tomatoes into small cubes. Bring vinegar, sugar, salt and spices into a heavy saucepan and heat on medium while stirring until it comes to a simmer. Add chopped onions, ginger and green tomatoes. Reduce heat to low, stirring occasionally with a wooden spoon to prevent sticking. Simmer for about 30 minutes. Add apple cubes, continue to cook ~10 minutes. Mixture will be reduced and thick. Cool on stove, then ladle into jars, cap tightly. Keeps about 6 months on the shelf, longer in the fridge. Place apples and blackberries in a heavy saucepan (do not use aluminum), cover with water. Bring to a boil, reduce heat to medium and let simmer for 10-15 minutes until pulp is soft. Strain the mixture through a fine sieve, then filter through cheesecloth or coffee filter paper. You want 4 cups of juice, add water if there’s less than that. Compost the pulp and seeds. Return juice to clean saucepan and bring to a simmer, cook for 10 minutes. Skim off any foam that comes to the top using a wooden spoon. Stir in the sugar until completely dissolved. Continue to cook until the liquid reaches thread stage [220ºF or 110ºC,]. Pour jelly into sterile half pint jars leaving 1/4 inch headspace. Cap and process 10 minutes in water bath or cool and seal with wax. Last spring and summer my region got so much rain that the apples and peaches went crazy. About 20 inches above what is considered ‘normal’ in this microclime, and this microclime ‘normally’ gets a good inch of rain a day (average) from mid-March through June. Anyway, two of my apple trees were so overloaded with heavy fruit that big limbs sank onto the grape arbor, and finally broke off altogether. The peaches – first year the volunteer from a seed in the old compost bin had produced full fruit – ended up with its limbs sunk onto the pumpkin patch, not broken off, but split along the bends. And the grape vines, which daughter had over-pruned the year before so I hadn’t pruned before season, were so thick I had grapes growing on the ground, even as sturdy fence poles supporting the arbor sank low over the upper end of the mints below. So I’ve got the clippers, loppers, hand saw and chain saw set out on the shed workbench and ready to go to work once the snow’s melted. While grandson and/or hub are armed with the chainsaw, I’m going to finally get rid of the ugly back yard he-holly I’ve been hating for years now, and about half the boxwood out front that blocks way too much sun from the solarium. Figure I’ll just cut the apple trees in half. They were originally those nifty Stark “columnar” apples I ordered on line nearly 20 years ago and planted too deep. Instead of being a 10-foot tall central, vertical limb with apples all around, they reverted and got 25 feet tall with branches everywhere straight up. Too tall for me to reach, I engineered a hand-claw onto a big plastic drink cup and duct taped it to a long sapling pole so I could pick ripe apples in the upper reaches, but I’m thinking just cutting them short should encourage more low level fruiting. If not, I’ll just take ‘em down and plant new apple trees on the upper terrace above the driveway next year. The peach is trickier, because ‘m just not sure how to prune it properly. It’s nearly 30 feet tall after 4 years, so I figure it’s probably not a true mini. I’d like to encourage it to be short and thick, though, more spread out but less likely to droop to the ground when full. I already know that any removed large limbs or portions of upper trunk need to be slant-cut so water won’t stand on the ends to encourage rot, and that I need to paint those cuts to seal them. But planning what cuts to make is a thoughtful job, for which it’s best to follow the advice of agricultural ‘experts’. For that purpose I’ve gathered some good sources – complete with detailed illustrations and instructions – and offer them below. Will take pictures of the before and afters, with more to follow at mid-season and harvest to show how well the project works for what I’m aiming for. Stay tuned, and if you will be pruning your fruit this month or next, please do check out the sources at the links below. They could help salvage older trees/vines, and increase your harvest! Antioxidants vs Radiation: Lemon Balm! Most of us who are committed to the homesteading lifestyle are committed because we perceive the value of living closer to the earth, taking responsibility for ourselves per the ‘conveniences’ of life, and care a great deal about the general health and well-being of ouselves, our families and our communities. A lot of us grow a lot of our own foodstuffs so that we can know “what’s in it” when we eat it, and some also raise their own livestock to receive that high quality protein from a source unconnected with the impersonal death industry that meat and dairy production has become in this modern age. And for the general robustness of our bodily defense and repair mechanisms – so important to maintaining health and promoting longevity – the value of antioxidants is something we’re familiar with. Antioxidants serve to reduce the amount of “free radicals” in our bodies. 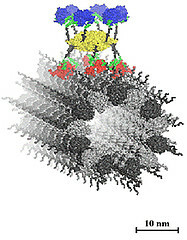 Free radicals are loose, fast-moving electrons (and sometimes positrons) that damage molecules and cells by knocking electron shells of atoms out of whack, thereby disrupting molecular bonds. And while a certain amount of oxidative reactions are part of normal metabolic processes, excess amounts of it can cause all sorts of problems. So plants and animals maintain multiple types of antioxidants to balance the processes, such as vitamins C, A and E, glutathione, certain enzymes and peroxidases, etc. which protect against oxidative stress which can cause neurodegenerative diseases, the ailments of aging, and even cancer. Okay, okay. We’re convinced. Many of us even know which of the foods we choose to grow and/or eat pack the most antioxidant whallop. But what about antioxidants that are used to prevent damage from oxidative health hazards most of us are not all that familiar with? Like, say, radiation exposure. 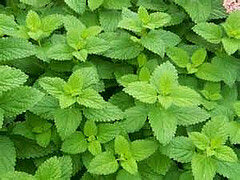 Posted on January 26, 2014 Author wiseadminCategories Environment, Garden, Harvest, Health, Homestead, YardTags Cultivated Herbs, Emergency Preparedness, Environment, Garden, Health, Herbal Medicine, Homestead, Landscaping, Medicine, YardLeave a comment on Antioxidants vs Radiation: Lemon Balm! Is Consciousness a Universal Aspect of Life? Many years ago, when I was harvesting peppers and tomatoes in my very first yard-garden soon after my husband got out of the navy, a friend and I got into a discussion about the then-current ‘fad’ of talking to plants (and playing them good music) on the assumption that plants must be included on a supposed continuum of consciousness that extends through life itself from the smallest to the greatest. We had just recently given up eating meat in favor of an ovo-lacto vegetarian-like diet, no longer wishing to participate in the industries of mass death represented by the consumption of meat. My friend asked if I wasn’t also guilty of visiting death upon those poor tomatoes and peppers, if I was willing to accept that a continuum of consciousness did exist. I laughed a little bit, and explained that those tomato and pepper plants I’d raised from carefully tended seed and interacted with regularly as they grew to maturity and fruited had an existence entirely limited by the length of the growing season. They would die regardless of whether or not we ate their fruit, as producing the fruit – and the seeds inside the fruit – was their ‘purpose’ in living at all. And because I cared enough about them to bring them to life from seed and tend them so lovingly, my time-limited tomato and pepper plants would be thoroughly insulted if we didn’t thankfully enjoy their fruit to the nourishment of our longer-lived and far more conscious bodies, perhaps save some seeds toward the perpetuation of their species during the next growing season. Now, I admit it was a pretty silly conversation. But it was the ’70s, we were just beginning to set out on the path of homesteading and desired self-sufficiency, and plant consciousness was a regular big deal in some corners of the “expanded consciousness” new-agey movement. And truth is, if my family were in dire need of nourishment and it were not readily available for some reason, I’d have no problem killing, cleaning, cooking and eating whatever critter would best serve the need. Even rattlesnakes or lizards (taste like chicken), squirrel, deer, bird of any usable size, etc. Heck, during the Depression my Mom lived on her grandparents’ farm in Georgia because there was no work in Miami for her father. She managed to cut off the end of her finger trying to get the head off a rooster with a hatchet for Sunday dinner, so learned how to ‘flip’ the heads off chickens instead. People will do what they need to do to stay alive. My issue was primarily that I wasn’t willing to raise animals to kill – or kill them – and don’t believe that having some gigantic death industry do it for me so I don’t have to think about it is all that justifiable. That’s just me, of course. Many homesteaders raise and slaughter their own animal livestock, which I believe to be an honest approach to eating a meat-based diet. Good on them to be willing to so honestly deal with the higher-grade consciousness of animals in that way. After costing the nation plenty to pointlessly shut the U.S. government down for two weeks beginning October 1st, the Republicans in the House and Senate are now back at their job of desperately seeking ways to hurt as many Americans as possible. Seems nobody was impressed by the shutdown grandstanding, which cost my region of Western North Carolina a million dollars a day to our biggest industry – tourism – at the very height of Leaf-Looker season. The Blue Ridge Parkway was open for driving, but all amenities were shut down. Smoky Mountains National Park was closed down entirely. All so the Tea Party wing of the Republican bloc could throw their little temper tantrum over the idea that Americans might be able to obtain affordable medical care under the Patient Protection and Affordable Care Act passed by Congress in 2010. So now that they’ve cried uncle on that, they’re going after SNAP [“Food Stamps”] big time as the Congress tries to clear its slate for the year for the session before the members go home for the holidays. SNAP benefits are already being cut on November 1st as the 2009 stimulus bill, enacted in response to the Great Recession of 2008 when a consortium of the world’s biggest banks and insurance companies crashed the economy and threw tens of millions of Americans out of work, expires. The Senate version of the Farm Bill cuts $400 million from the SNAP program, while the House version seeks $4 billion in cuts. The two versions will have to be reconciled in order to bring about a bill the President can sign into law, so hold on to your napkins! SNAP has been part of farm legislation for many years, as it is tied in with certain farm subsidies. Now, few of us small-time producers would be very upset if ADM or other huge Agribiz outfits lost their lion’s share of subsidies, but a growing number of us understand only too well how much of a good economic stimulus the program really is as our outlets have been authorized to accept SNAP benefits for produce and value-added food products we work so hard to offer our neighbors and larger communities. Worse, some of us are only too aware of how much this is going to hurt our normal customer base as children and families are forced to do without something so vitally important as food. In America! What is wrong with these politicians?!? There are a number of petitions circulating to denounce these cuts, and I also urge my fellow homesteaders to get in touch personally with phone calls and letters to representatives and senators in D.C. Let them know that making hungry people do without food is NOT an acceptable fall-back position after your attempt to make sick people do without health care fails. There are mid-term elections next November. Make sure all eligible voters in your household are duly registered and can jump over the voter suppression hoops Republicans in several states (including mine) have erected, then vote for some real honest-to-goodness humans who don’t see their task in life as making sick people do without medical care, and hungry children do without food. Posted on October 28, 2013 Author wiseadminCategories Economics, Food, Food Production, HarvestTags Community, Economics, Farm Policy, Homestead, Hunger, Nutritition, Political Action, PoliticsLeave a comment on Politicians Harming Americans. Again. My southern Appalachian homestead was originally purchased more than twenty years ago as the high country standard of “13 acres more or less, graded.” That means they took an overhead map (probably one from the USGS with elevation lines), put a 1-acre grid over the top of it, and counted the acres within the boundaries. The fact that it is so steeply graded means there’s a bunch of land that if flattened out, would add greatly to the total acreage. We have walked the land a lot, and the true number is nearly 25 acres, most in thick stands of third-growth temperate hardwood forest. There are a few scattered giants, trees that are at least two hundred years old, but the rest has been logged and/or burned more than once since white folks drove the Cherokee west. There were large stands of wild ginseng and black cohosh growing on the rich tilth of well-shaded hillside when we got here, and I began the project of re-planting and managing (against invasives) of these valuable medicinal herbs. To a lesser degree we’ve got a smaller stand of introduced goldenseal in the bottomland of the smaller creek across the ridge, and we also occasionally tend collections of other marketable wilding herbs fancied by herb dealers and shop owners. September is the big month, when in my region the roots and herbs are gathered, dried and taken to one of the itinerant licensed herb dealers servicing the region. As the herb season is in full swing in North Carolina, Tennessee, Kentucky, Virginia and West Virginia, an age-old problem has reared its ugly head as the price for ‘sang (and black cohosh, an at-risk medicinal) has skyrocketed. Poaching. Last season wild-managed ginseng topped $800 a pound, definitely the “gold standard” among wildings in these parts. It takes a lot of roots to equal a pound dried, and they must be kept intact enough for the dealer to determine their age. Some years ago when wild American ginseng first made it to the endangered plants list, restrictions were imposed to the ability to sell your crop. Wild roots are not marketable at under 5 years or over 15 years. This was done in hopes of salvaging the truly wild stands from poachers, who aren’t shy of who’s land they’re stealing from. Illegal harvesting of ginseng has become so rampant that the U.S. Forest Service cut the number of 3-pound national forest harvesting permits by 75%, but as much as 90% of diggers don’t bother with permits in the first place. So it is increasingly falling to us rural landholders, if we have the ability and conditions, to preserve this plant to the best of our abilities. Both for our own income purposes as an annual cash crop with careful management, and as preservation of a valuable botanical in its native areas. There are definite plusses for committed homesteaders in putting even the wild areas of our ‘steads into some kind of production that can help support our lifestyles. A good overview of the project comes from NCSU, Cultivating Native Woodland Botanicals. Ginseng can be – and is in many places – grown in artificially shaded plots and usually sold young. Wisconsin grows about 95% of the farmed ginseng in this country, a $70 million crop for the state. But this ‘sang usually sells for a mere $18 to $24 a pound – nothing close to the $800+ a pound wild ‘sang is earning. If correctly managed there is no discernible difference between forest-managed and truly wild ginseng, though well-managed beds chosen for their thick tilth of forest floor will return larger roots than wildings that may have rooted in shallow tilth or in beds choked with sizable rocks. Good managers never harvest a root without planting a few small young roots or several seeds. It takes two years for the seeds to sprout, so it’s important to get them before the deer do when they ripen to bright red, and further to discourage deer from foraging where your ginseng is growing. But fear not – even if deer do eat your leaves and seeds one year, the plant will come back next year as long as the root is still in place. Meanwhile, in my area the N.C. Ginseng Association is actively recruiting homesteaders and landowners for development of more forest managed ginseng crops. Other herb companies in areas where ginseng grows are organizing the same sort of thing, which might offer newcomers to the idea of forest farming some valuable knowledge and physical help to get started. You may end up having to police your own crops for poachers, though, so a little tidbit of wisdom I was taught back during my childhood by a wild ‘sang manager in eastern Kentucky should be kept in mind. “Don’t tell people about your crop.” Plus, it doesn’t hurt to have a dog either. Good for keeping poachers, deer AND bears away! Do give it some thought, consider if your land is suitable for ginseng. And/or black cohosh, goldenseal, spikenard, elder or any other of the increasingly valuable botanicals marketable these days. Poultry Project 5: Duck Eggs… Yum! We’ve not found any out and about the yard yet, so perhaps our ducks will prove to be the exception and lay in their coop at night instead of littering the yard. Though since one of them is laying two during the night, I expect we’ll find some Easter presents here and there over time. This morning when I opened the coop there was one chicken-sized duck egg, and one that was at least twice that size – a real monster of an egg that won’t fit into the egg crate! Given that ducks come in all sizes like people do, we will now have to re-name our presumed male, who is much heavier than the other and isn’t a male at all. We had scrambled duck eggs for Sunday brunch and they were delicious, but my family simply doesn’t eat enough eggs to keep up with production at this rate. Luckily grandson’s girlfriend has a co-worker who is eager to buy any and all fresh duck eggs we want to sell, and will pay 75¢ apiece for them. Though I’m going to charge a dollar for the Super-Size. Doing my homework, I have found that duck eggs are higher in protein than chicken eggs, and the yolks are higher in fat. Overall significantly higher in nutritional value than chicken eggs but take a little getting used to. They taste fine, but if you used them in baking – like a cake – you need to cut back on the shortening (butter or Crisco) or it’ll turn out too rich. For omelets you’ll want to add a bit of water to thin them out some, but far as I can tell they can be prepared in all the same ways chicken eggs can be cooked – hard boiled, fried, scrambled, etc. Whipping whites takes a little more effort to get them started, but they hold their foam and shape even better than chicken eggs. I’ll put all the money I make from selling the eggs in an “Egg Money” jar atop the ‘fridge, and that should pretty much offset the cost of bedding and feed. The eggs are said to keep up to 2 weeks without refrigeration, a month if they’re kept cold. Which is good, so there will be half a dozen at least for the customer, though I might sell the big ones one at a time. Still haven’t managed to install the duck pond, though we have started digging. So the kids are still stuck with one of those cheap plastic kiddie pools, which I move around the yard every couple of days so it doesn’t kill the grass. They’ve got their sliding form down pat on the porch ramp, make us laugh regularly by how much they enjoy it. Figure we’ll next have to teach them to skateboard, and if we can manage to get Gladys to say “Aflac” WHILE skateboarding, we can make a fortune! All in all, the ducks have proven to be wonderfully funny pets, love hanging out with people and other critters, and have even turned out to be excellent snake alarms. They keep the yard and garden picked fairly clean of slugs and bugs, don’t manage to snag butterflies very often. Their favorite thing is to take walks with us whenever we go to the top of the drive to get a cell phone signal, and chase the cats around the yard with their necks down and wings half outstretched as if that were the funniest thing ever. The cats don’t agree, but the dogs think it’s highly humorous. Last but not least, we’ve figured out where the term “Lame Duck” comes from. Our fat used-to-be male duck can’t see his feet when he’s waddling around on the hillside, has taken several tumbles that have us considering some kind of barrier that would prevent the ducks from getting that far up the hill. Sprained his ankles so badly I was afraid they were broken, so I had to sit out with him all day for a week to make sure he didn’t wander uphill and learned to lie down when not actually trying to get somewhere. Poor thing was so lame he… er, she, didn’t know which leg to limp on. Googled to see what was to be done and discovered that these big ducks sprain their ankles quite regularly. I could wrap them, but that’s a difficult feat that would only last as long as it took for the duck to go swimming, so I didn’t bother. 50 mg. ibuprophen – I got the 100 mg. children’s chewables and half them – worked great as an anti-inflammatory and she’s much better now. More careful as well, which is fine with me. Autumn project is to tear out the entire back deck so it can be re-planked, the old wood is rotten and beginning to give way. That will allow us to lay a concrete pad underneath, onto which we can put the coop – we’ll have it on lawn mower sized wheels to roll out for cleaning. Can go ahead and put in a concrete half-pipe drain next to the basement wall at the same time, which should finally cure the flooding issue every time it rains hard. Which around here, is every day all summer. The Poultry Project: 1… Peeps! The Poultry Project 2: Quills! 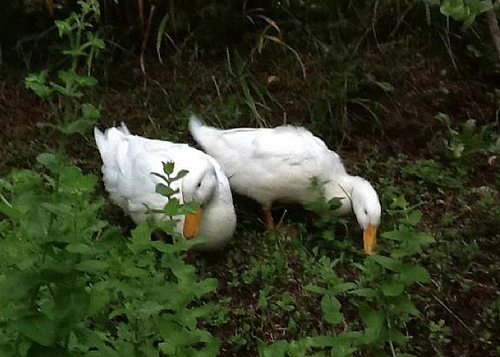 Posted on August 28, 2013 Author wiseadminCategories Cash Crops, Food Production, Harvest, Livestock, Pet, PoultryTags Cash Crops, Dairy, Food Production, Health, Homestead, Livestock, PoultryLeave a comment on Poultry Project 5: Duck Eggs… Yum! Just a bit of Father’s Day excitement here on the ‘stead, where this morning Sirius the Cat was seen stalking a slithery something in the jasmine growing along the garden fence next to the gateway. Here in the highlands of the Blue Ridge – we are about 4 miles as the eagle flies from the eastern continental divide in the Western No’Cakalackie southern Appalachians – we don’t have that many pit vipers to worry about. Only ones we ever see, in fact, are copperheads and timber rattlers. Copperheads aren’t very long or heavy snakes, but they’re aggressive as hell and will actually chase you (or your cat, or your dog, or your grandkids) down just to get a bite in on something they’re either too mean or too stupid to know is never gonna fit into their mouth. In the 21 years we’ve lived on our remote homestead acreage we’ve averaged a copperhead a year to add to the fence collection of heads, but that really means some years we get several and some years we get none. Grandson who has lived his whole life with us has never been bitten, but another grandson and a nephew visiting from their cities have. You can warn those city kids until you’re blue in the face to watch where they’re walking and stay away from snakes, but they’ve just no experience of the “deep woods” to rely upon, and that can easily end in a quick and painful trip to the ER and an inevitable argument with the ER staff who always want to insist that we can’t possibly know what kind of snake did the biting. Even though we’ve killed it and packed its head into a zip-lock to prove the point. Doesn’t exactly lend great confidence in their treatment skills, which no doubt helps to explain why grandson Number 2 ended up losing half his thumb to his copperhead. And just so you city folk can know, copperheads and timber rattlers look nothing alike, nor are their habits anything close. Rattlers are a bit more evolved than copperheads, at least in my estimation. They are quite mellow temperamentally, generally avoid biting animals they can’t fit into their mouths (why waste precious venom? ), would much rather do a little macho dance and rattle their tails menacingly instead. Sound a lot like cicadas, so that can be confusing if you’re not paying attention. And while they can easily blend into the scenery of a dappled forest floor or rock outcropping, out on the lawn or in the garden these heavy-bodied snakes are darned hard to miss. Our Father’s Day rattler was just barely 3 feet long (they can get to six feet), had five rattles. Another urban myth about rattlesnakes – no, you can’t reliably tell how old the snake is by how many rattle rings it’s got. Because as the snake ages and more rattles are added with the annual molt, dried up old rattles at the end fall off. And while you may encounter a single snake when it’s on the hunt, rattlers tend to maintain familial relationships, sun themselves in groups and will den-in in large numbers during the winter. Of course we kind of felt sorry for him, as rattlers generally don’t come into the mowed areas of the property at all, and this is the first one I’ve ever seen in the garden vicinity. We have a nice collection of nifty snake beheading devices kept in groups at several places around the property where copperheads are likely to show up, and a well-practiced alarm system for when one of ‘em does show up. The spotter must stay put and holler “SNAKE!! !” as loudly as possible, without taking his or her eyes off the thing. Because if you do, it’s going to disappear quickly and then you’ll know it’s around but not where. We who hear the alarm then hurry to the closest beheading device storage and grab at least one long-handled device and one short, head to the scene of the showdown. We do not usually attempt to kick the snake to death barefooted – much prefer a hoe, a shovel, a heavy bank scythe, a sword, or a machete. For this one grandson used a hatchet (as seen in photo above). People eat these rattlesnakes, I’ve heard they taste like chicken (doesn’t everything?). But since we don’t eat meat of any variety, we buried the body. If it had been as slim and lithe as the usual copperhead we’d simply have tossed it off the mountainside into the deep woods, but this one would be far too tempting to the dogs. Rattlesnakes are pretty mellow critters as snakes go. Those rattles are there so they can warn you, which is kind. Their venom has been known to kill humans, but they don’t bite unless they have to. We nailed the head to the fence, a custom we learned in west Texas many decades ago. ‘They’ say it’ll keep the snake’s brothers away, but I’m not convinced that’s true. Doesn’t work that way with copperheads, anyway. Where there’s one there’s always another nearby that you aren’t seeing. I guess we’ll find out if that’s how it works for rattlers too. Oh… and hanging the head on the fence makes it rain, the same ‘they’ say. It rains an inch a day here in the southern Appalachian temperate rain forest this time of year, so I can’t swear to that one either. At any rate, we’re into snake season now. While there are just the two species of poisonous snakes in my area, there are other varieties of venomous snakes in other areas of the country. Check out some of the useful information in the following links, and don’t forget that venomous snakes are a threat to pets and livestock as well as to humans. Happy Summer, and watch out for snakes! Despite the April freeze, which managed to hit after a March so warm that all the fruit had already blossomed, a goodly amount of concord and muscadine grapes managed to overcome the stress, and the cinnamon pears are falling at easily twice their usual size. And while harvest is a few weeks early this year due to the extraordinarily warm spring, the fruit is super-luscious from a summer of more than ample rainfall. After the hail got my corn crop and the super-weeds got my tomatoes, it’s nice that something’s coming in with enough abundance that I’ll be able to trade pear butter and jam for all the crops that failed in the lower terraces. Will need another two or three dozen half-pint jars before it’s over, but August is its usual perfect weather (August and September in these mountains are absolutely the most perfect-weather months of the year, though not the most colorful). It’s cool enough to start the indoor processing, so that’s just what I’m doing. Processing is a several-part ordeal, but will then give me plenty of pear mash and grape mush to construct the goodies. 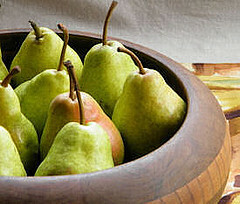 Today I have enough pears to fill my heavy stock pot half full after chopping, about 18 individual pears. Wash and remove the stems. Quarter and then half the quarters. Even bruised areas are good, just be sure to excise any actually rotten spots. Add enough water to keep the pears from sticking (about half a cup), and bring to a boil covered over medium heat for about 12-15 minutes. Stir it a few times to make sure all the pieces get good and soft, remove the lid and simmer for another 5 minutes to reduce the originally added water. Push the resulting ‘stuff’ through a sieve to get the seeds and skins out, stir in a tablespoon of ascorbic acid (available in the canning section) or two tablespoons of lemon juice, and set the pulp aside. Then it’s the grapes’ turn. Add a quart of stemmed grapes to a half pint of water and again bring to a boil covered, over medium heat. When it’s been going for about 10 minutes mash with a potato masher to separate the innards from the skins. Continue to boil lightly uncovered until the innards liquify (about 10 minutes). Sieve the results as with the pears to remove seeds and skins. Reserve juice. In a heavy stock pot combine the pulps, honey, and rosemary. Bring to a simmer and cook, stirring frequently, for 30 minutes or until liquid is reduced by about a cup. Remove from heat and let steep for 5-10 minutes. Remove and discard the rosemary sprig (be careful to not lose any of the needles). Pour or ladle the jam into hot, sterilized half-pint condiment jars, leaving 1/8″ head space. Wipe the rims clean and attach sterilized lids, screw on the caps finger-tight. Process 10 minutes in water bath canner, cool on a wire rack. Before storing make sure the lids have popped to indicate vacuum. Should fill 6 half-pint jars. Ball makes very pretty half-pint jars, which are just the right size for gifts or trade. These can be further “fancied” for the purpose of gifting by cutting out circles of bright fabric to place over the lids but under the screw caps. Great hostess gifts for the upcoming holiday parties, and as part of Christmas edible gifts of fudge, cookies, dried veggie crackers and jam. Slowly bring mixture to a simmer, stirring frequently. Continue to simmer for 5 minutes. Ladle into sterile half-pint jars. Wipe lips clean and attach lids, screw caps finger-tight. Process in a water bath canner for 10 minutes, remove and cool. Posted on August 13, 2012 March 15, 2015 Author wiseadminCategories Family, Food Production, Harvest, Holidays, Nutritition, RecipesTags Barter, Cultivated Herbs, Food Preservation, Food Storage, Harvest, Holidays, Homestead, RecipesLeave a comment on Incoming Fruit!